Straw bales are a highly insulative, low-embodied-energy, natural building material made from an agricultural waste product. For many, they are locally available and affordable. 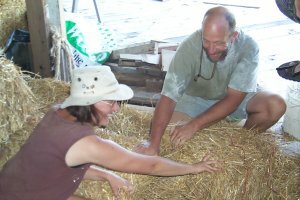 Straw is easy to work with for people new to construction as they are flexible and can be very forgiving. Straw bale homes can also be beautiful. They often have graceful, elegant curves, delightful window seats, and can have exciting sculpture and mosaics integrated into the plaster. When building your house by hand it is easy to incorporate elements of beauty. Strawbale buildings can be generally characterized as either load-bearing or non-load-bearing. In a load-bearing straw house the weight of the roof is supported by the bales themselves without any other framework. Non-load-bearing straw buildings have a frame made of wood or other material and use the straw bales to fill in the walls and create insulation. Load-bearing buildings are generally limited to one story and are often small. If designed correctly they can require less wood than non-load-bearing buildings. Non-load-bearing buildings often use a post and beam frame with straw bales as infill to create the walls. They can be any size and shape and have multiple stories. One advantage over load-bearing is that the roof can be finished before installing the straw bales which makes it easier to keep them dry (a critical factor in straw bale construction). Another advantage is being more easy to get building permits for (at DR we have no building codes so do not need building permits). Buying Good Straw Bales – The first step in having a good straw bale house is to pay serious attention to the quality of your straw bales. The ideal bale is made of densely packed, long straw fibers. It is kept clean and dry. It is ideally tied with poly-pro twine or as a secondary option metal wire (metal can rust in some situations). It is best to have your bales custom made by the farmer, having them combine the grain just below the seed head, then mowing the straw near the ground (to get the longest fibers) and then baling the bales as tight as possible without bursting. If this is not possible look for bales that are not squishy, do not easily deform, and are heavy (but dry). Compression – For load-bearing buildings pre-compression seems like the way to go (from our experience of not doing so). You’ll also find compression to be useful in non-load bearing applications, by sizing the wall cavity to 1 inch less than the expected height of the bales. You can compress the straw bales using a piece of plywood and car jacks and a piece of plastic to help slide the bale. Having the bales compressed adds strength to the wall and keeps bales from slipping against each other. Re-tying and Modifying Straw Bales – Bales can be retied to any length using a bale needle. It is worth some effort to design a home to minimize retying but it is not so much effort that major design changes need to be made. Straw bales can also be modified using a chain saw to notch around framing members, electrical boxes, etc. Bales can have one string re-tied short so the bales can be curved around windows. Niches and other sculptural features can be added with a chain saw after the wall is in place. Light-clay-straw for filling voids – Straw bale walls will inevitably have voids that need filling, especially at the corners of bales. Stuff deep holes with dry straw at first and then start adding clay-slip to your straw so that the final stuff has a serious amount of clay. Work this clay straw into the cracks between bales to secure it into the wall. It will dry to a hard firm surface that can take plaster beautifully. Big Overhangs – It can’t be said enough that big overhangs will help protect your strawbale wall. If you want to do exterior plaster with earth this is essential. A two foot overhang at 8 feet high is a minimum for a place with frequent driving rainstorms. Be wary of gabled roofs that leave ends of buildings with an overhang 16 or 20 feet high that will provide almost no wall protection. Consider porches, trellises, and other landscaping to block rain and break up wind. Big window sills – Water running off of windows can damage plaster below the windows. By having a window sill that sheds water away from the building plaster can be preserved and leaks prevented. Passive Solar Design – When trying to incorporate passive solar heating it can be difficult with a load-bearing straw bale home to get enough window space on the south side of the building without losing structural stability. One can have posts and a beam for the south side alone but you must then plan for bale compression on the other sides. Earth Contact – In our climate, insulation is great but direct contact with the earth is what helps keep a straw bale home cool in the summer and easier to heat in the winter. See our information on Earthen Floors. Burlap to Connect Wood to Straw – One of the most serious plaster problem area is the interface between the straw and other materials such as wood. If the wood is to be plastered over we have had great success using burlap. Many straw bale books suggest metal lathe, chicken wire or stucco netting. Unless your are doing machine applied plaster avoid these at all costs! They are a pain to plaster around. You can take the burlap and staple it to the wood using a staple gun, overlapping it 3-4 inches onto the straw. Then coat it in clay slip and embed it in the infill coat of plaster (by ronni at www.dresshead.com). The burlap is an incredibly strong network of fibers that prevents the plaster from cracking at this juncture. Dancing Rabbit as a great place to build straw bale and other natural buildings. Visitors can get hands on experience and we hope to have more natural building workshops in the future. If you already have experience with natural building, we’d love for you to build your straw bale home here at DR, and share your skills with us as we share ours with you. Plus we have many paid work opportunities for those with building skills from those in the village who want help building a home. If you are interested in building straw bale or other natural buildings at Dancing Rabbit, then please learn more about joining us.